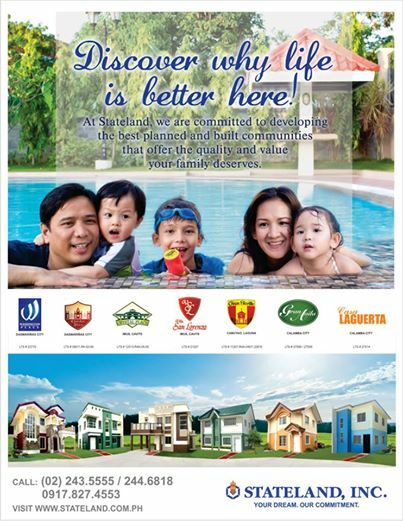 Calamba Laguna | Stateland, Inc.
Two new housing projects under the renowned real estate developer Stateland, were formally launched last July 20, 2013. These two brand new communities, the Gran Avila in Majada, Calamba City and its neighboring subdivision, the Casa Laguerta served as the keys of realization to every Filipino families who wish to have well-designed and well-built houses of their own without compromising its quality and at the same time having prices that suits their budget. The grand open house took place in the Gran Avila site in Majada, Calamba City, and was graced by the First Vice President for Sales and Marketing, Ms. Delie U. Chua. The open house beacons a new beginning for the renowned developer as it starts the third quarter of the year with a blast. It was attended by the different group heads, brokers, sales agents, employees, staff and prospective clients. Prior to the grand open house for the Gran Avila and Casa Laguerta are the project orientations both for the in-house sellers and company brokers. The Gran Avila and Casa Laguerta In-house sOrientation was held last July 2 at the Gran Seville clubhouse, another notable project of Stateland in Cabuyao, Laguna. The project orientation was held to give the in-house sellers a brief yet sufficient background of the features and quality of houses in Gran Avila and Casa Laguerta. The orientation was well attended by almost a hundred of in-house sellers, group and division heads. A general overview of the project site and products was tackled by Mr. Ryan de Guzman, head of the Marketing Development and Research team while the specifications and technical descriptions was discussed by Arch. Jerome Ilagan of the Planning Department. Stateland President Mr. Reynaldo T. Cometa was also present in the program to give the sellers a brief analysis of the projects and an inspiring message that would keep them motivated and encouraged in selling the Stateland projects. On the other hand, various real estate licensed brokers were also briefed about the newest projects of Stateland through the Gran Avila and Casa Laguerta Brokers’ Project Orientation held last July 12 at the Cinema 2 of SM Sta. Rosa in Laguna. This orientation was attended by over 500 brokers and sales agents who are interested in selling the latest projects of Stateland Inc. Surrounded by a wide screen monitor and supreme sound system courtesy of SM Sta. Rosa cinema, the brokers were well informed about the developments of the Gran Avila and Casa Laguerta. First Vice President of the Planning and Production Group, Arch. Grant Orbeta discussed the technical description of the two new rising communities in Calamba. Both the in-house sellers and brokers are now equipped with enough knowledge about the soon to rise communities in Calamba, Laguna. As a part of the commitment to the Filipino people, Stateland Inc. continues to provide Filipinos the homes they deserve. It offers quality homes in well-developed communities and picturesque landscaped areas, in the most affordable prices. The company is continuously creating innovations in the real estate industry not only for the betterment of its people, but also of the nation. To know more about the developments and more information about Stateland’s newest projects, contact the Marketing group at 244-6818 or 09178274553, or visit www.stateland.com.ph and the official Facebook page at www.facebook.com/StatelandInc.